Manly Warringah Sea Eagles 33 defeat Cronulla Sharks 32. Two teams desperate for two different reasons. With spots still up for grabs in the top 4, the Sharks will be looking to continue their push to finish the regular season as a top 4 side. 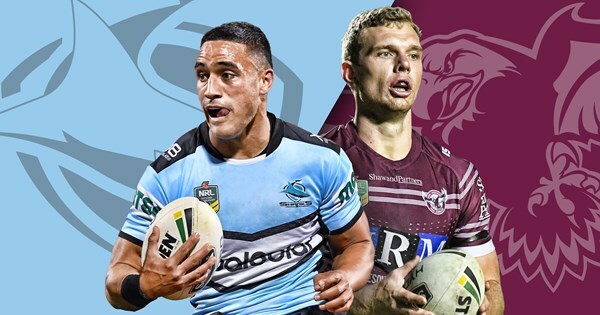 The Sea Eagles had to spend their weekend watching the Eels and Bulldogs win and the Cowboys come close to beating the premiership favourites. With those results, Manly drop to equal last, and are well and truly apart of the wooden spoon battle. It was the ideal start for the Sharks. 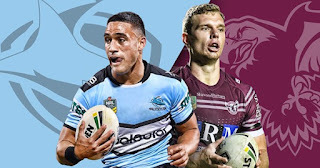 The opening minutes of the game immediately saw the Sharks go on the attack, and with a through the hands passing attack, Wade Graham went back to the inside to Valentine Holmes who raced away to score the opening try. Manly were able to respond not long after through Shaun Lane. The big man ran an ideal line off a set play before being given the short ball by Cherry-Evans to storm over the line. The game didn't remain tied for long though. More attack by the Sharks in consecutive sets deemed to much for the Sea Eagles with Cronulla going over again through Wade Graham. A short ball to Paul Gallen sucked in the defence which saw the captain pop a sensational flick pass out the back for Graham to take and go over untouched. Cronulla were starting to show their dominance at looked like they could begin to run away with this game. That was the case, and a massive string of penalties not only kept Manly in the game, but got them the lead. After being marched down field, Dylan Walker was able to step his way through the line and plant the ball down. The very next set Manly were marched down field again, but this time Cronulla saw Aaron Woods sent for 10 due to the quick fire of penalties. Daly Cherry-Evans once again did his magical thing and found Shaun Lane with an incredible short ball who barn stormed his way over under the posts for the lead. Penalties once again brought Manly down field, however a penalty goal was the option Manly went with after receiving another penalty in the Cronulla 20. The Sharks were lucky enough to get some penalties of their own, and were able to convert on the opportunity when a through the hands set piece went out to Jesse Ramien who trucked a few defenders and scored the try right on the half time buzzer. Manly took a 20-18 lwad into the sheds. It was an ideal second half start for Manly who instantly regained that 8 point lead. A high bomb put up by Daly Cherry-Evans was taken on the run by Tom Trbojevic who finished it off with a try for Cherry-Evans third try assist of the game. The Sharks were quick to grab those 6 points back through new recruit Aaron Woods only a few minutes later when James Segeyaro took advantage of a Manly knock on and in the attack set put in a grubber in goal for the big bopper to get his first try as a Shark. A penalty goal by Val Holmes a few minutes later levelled the scores with half an hour remaining. Cronulla were able to take the lead once again with roughly 20 minutes to go in the game courtesy of Daly Cherry-Evans. A attacking set kick by Cherry-Evans went dead in goal, but a cheeky attempt to slow down the 20 metre tap by picking up the ball and throwing it over by the fence resulted in a penalty to the Sharks. The Sharks were given the penalty, and on the attacking set Matt Moylan threw the dummy and massive left foot step to find his way over to score the try. The tennis match continued as Manly returned serve in the dying minutes thanks to a 4th Daly Cherry-Evans try assist. Cronulla missed the penalty goal from an easy position which would of sealed the game, however they got the ball back off the drop out but then dropped the ball which put Manly on the attack, and a pin point grubber from Cherry-Evans was dived on by Joel Thompson to tie the game with 5 minutes remaining. Despite a last minute effort by both teams, the deadlock was unable to be broken and we were off to extra time! The Manly Sea Eagles pulled off the upset in the very first set of extra time. Through the hands and offloads got the Sea Eagles up the field, and with rushing defence, Daly Cherry-Evans was able to snap the field goal off the left foot and win the game for Manly, becoming the third team in the bottom 4 to win this weekend.